A parliamentary committee has reported on widespread abuse of people with disabilities and recommends a number of immediate measures to prevent such abuse. After an extensive inquiry, the Family and Community Development Committee has made 49 recommendations to strengthen the disability services system in Victoria prior to the transition to the National Disability Insurance Scheme. “For too long, people with disability in Victoria have endured violence in all its forms,” said Committee Chair Maree Edwards, who presented the report to the Victorian Parliament today. “Throughout this inquiry the voices of people with disability, their families, carers, advocates and disability sector workers have reinforced over and again that the disability sector in Victoria is marked by an intrinsic lack of effective safeguarding and oversight. Fundamental change in the sector is needed to address these ingrained issues of violence, abuse and neglect,” Ms Edwards said. 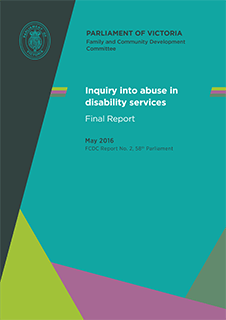 In its report, the Committee has recognised that women with disability are disproportionately affected by abuse. It has made recommendations to address this, including expansion of services to support women with disability. “This report demonstrates a compelling need for change,” Ms Edwards said.